TechKnowPartners provides consulting, design, installation, and support services to start-ups and early stage enterprises, with associated product packages including Primerserve and Progreserve. 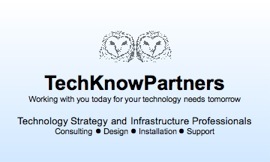 TechKnowPartners blends business and technology services (B/T). TechKnowPartners services for start-ups and early stage enterprises usually begin with a Hi-Spot review and/or a business plan.